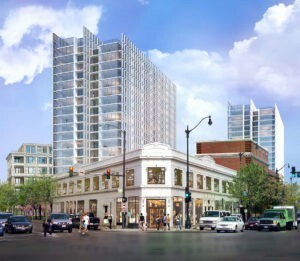 The Lincoln Common development at 2300 N. Lincoln is set to break ground on Thursday, May 4. Developers McCaffery Interests and Hines are transforming the former site of Children’s Memorial Hospital into a 6.04 acre mixed-use development featuring two luxury apartment buildings with a total of 538 units, approximately 92,000 square feet of retail and up to 60 low-rise condominium residences. Additionally, the development will provide the community with more than 57,000 square feet of accessible open space, including a landscaped central plaza, gardens, fountains and a children’s play area.